Looks like you’re viewing on a mobile device. Nice, and read on, but just to let you know this viewer is a desktop only product. It works on the latest version of Google Chrome on Mac and Windows. Give it a try for free with your webcam when you get back to your desk. Wowser! – It’s mobile UX in yer browser! 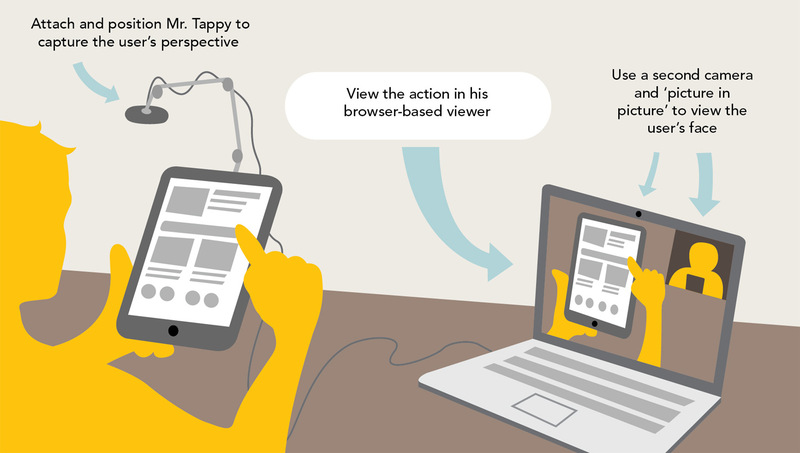 Yes, Mr. Tappy has his own viewer, so you can watch the interaction on mobile devices with his camera and even a second one without using any fiddly software or multi-app jiggery-pokery. They use him at their UX training days. With your permission, the Chrome browser can access your webcam and show what it sees, right here in the browser. Mr Tappy simply lets you show the camera-view on screen in a way suited for UX research on mobile devices. Including ‘picture in picture’ where you can have a second camera pointing at the person using the device. You can also record the main camera. (but not the PIP) and save the file locally. (It does not go onto a server, it stays on your machine. Plenty of UX pros use a screen recorder called Camtasia (PC or Mac) or Screenflow (Mac) for doing this. But it made sense to have a simpler way to do it. Mr. Tappy is a one man business and my business is to help you do your best work, easier. What you do with your camera is your business and that’s that. Mr. Tappy viewer can be used simply to view a webcam. That’s literally all it does. So the image is a fleeting snapshot in time. It isn’t saved or sent anywhere unless you choose to do so. You can record video from the camera using the record function. This will save a file locally only, it doesn’t go to any servers on clouds. It stays on your computer. You may wish to use a third party recorder or streaming software to allow people to watch remotely… that’s your choice. In some cases the more the merrier, but I’d advise being careful to respect the privacy or research participants. We can’t do our job without them.